Big Machines – complex shapes. 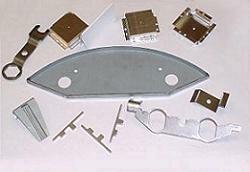 Our production team are able to manufacture all kinds of presswork, metal stampings and pressings on site. Presswork is commonly referred to as metal forming. 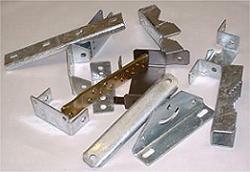 Forms include domes, folds, bends, brackets, clips, clasps etc. We can offer pressing up to 150 tonnes and process from a range of materials. We are able to offer most grades of mild steel, copper, aluminium and stainless steels. Details of the processing available are on our equipment page. In addition, we can offer surface finishing services from our trusted partner companies. We can produce simple press tools in house which means we can monitor the quality of tooling production. More complicated tools are sent for specialist manufacture. High quality components are made using these tooling from mild steel, stainless steel and aluminium. The grades range from 0.3mm aluminium up to 1.5mm mild steel. Our heavy press section operates power presses up to 150 tonnes which can press materials up to 6mm thick. Furthermore, pressings can be treated with a range of finishes after manufacture, including galvanising, plating and anodising. Press tools are made to do single hits or multiple hit stages. The tool will depend on the part to be pressed. The tool can be fed by coils, strips or individual blanks. Coil when used with a progression tool offers mass production options and therefore, reduced costs. In summary, our team will work closely with you to help you to understand any issues along the way, smoothing the progress as a result. If you have any questions you can give us a call to chat about your options.